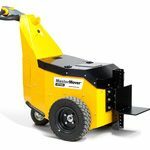 Move heavy loads easily with one of the innovative powered cart movers which we have available. 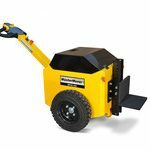 These battery powered material handlers are perfect for ensuring worker safety and increasing productivity when pushing or pulling heavy equipment. 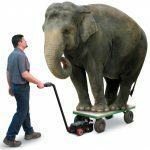 They are convenient and portable, with no electric cords or pneumatic hoses to trip over. 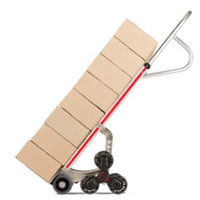 What are the Benefits of a Cart Mover? 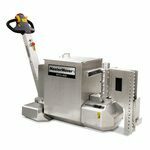 These cart movers are designed in order to be is versatile and can be used in many settings such as cell manufacturing facilities, hospitals, aerospace manufacturing, and vehicle repair or manufacturing. 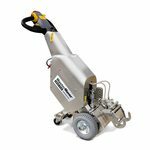 The SM100 Power Tow is a self-weighted electric tow unit; it generates its own traction so it can tow loads up to 1,100 lbs where weight transfer is not possible. The SM100 Battery Powered Tug is a battery-powered tug that generates traction through a leveraged weight transfer system. 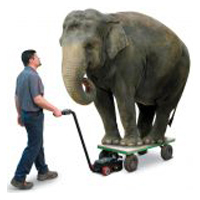 A portion of the load weight is used to apply pressure on the optimally-sized wheels, allowing a single operator to easily move loads weighing up to 2,200 lbs. 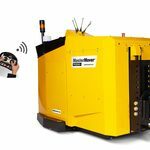 The SM100+ Powered Tug is the only SmartMover in the range to feature a hydraulic coupling point. 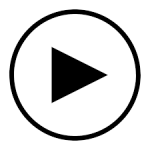 A press of a button is all that is needed to engage the hydraulics, creating an unbreakable connection to the load. 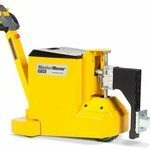 The SmartMover pedestrian operated tug is a versatile machine for moving loads in many different manufacturing processes. 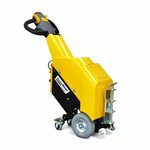 This tugger is frequently used in environments that require a specific level of cleanliness or where the machine needs to be corrosion resistant. The Electric Tow, AT200 TOW is perfect for safely towing loads where weight transfer is not possible, up to 4,400 lbs. 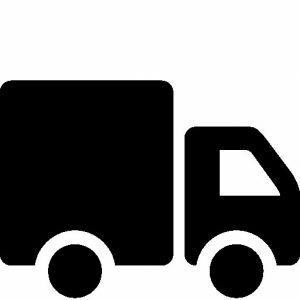 Attaching to any load with a drawbar, towing eye or ball hitch fitting is easy thanks to the coupling crawl function. 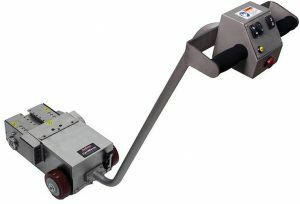 The Pedestrian Tow Tracker, AT300 TOW is designed specifically for towing loads where weight transfer is not possible and that weigh up to 6,600 lbs. The coupling crawl function guarantees easy connection with the load's drawbar, towing eye or ball hitch fitting. The MT300+ material handling tugger is the first MasterTug in the range to use a hydraulic weight transfer system. A hydraulic mast lifts part of the load weight in order to apply pressure to the industrial drive wheel, resulting in traction. 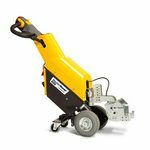 The MasterTug MT400+ is designed to allow a single pedestrian operator to easily push, pull and steer wheeled loads weighing up to a maximum of 8,800 lbs. The MasterTug MT5/400+ SS is an electric tug completed in a 316-grade stainless steel chassis with a minimum IP44 protection. 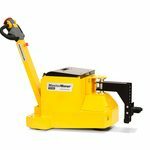 The compact size and easy to use functions make this electric tugger perfect for moving heavy loads up to 8,800 lbs in areas with restricted space. 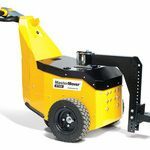 The Industrial Electric MasterTug MT800+ is designed to allow a single pedestrian operator to easily push, pull and steer wheeled loads weighing up to a maximum of 17,600 lbs. The Appleton CartMover come in two distinct models, standard and light duty. 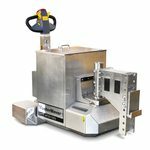 These units are designed to move product weighing anywhere from 100lbs. to 20,000lbs. depending on environmental conditions. Both units contain a Programmable 110 Speed Controller and Variable Speed Throttle Grip. Constructed from Stainless Steel this unit is designed to perform in the Food and Pharmaceutical Industry. With capacities ranging from 100lbs. 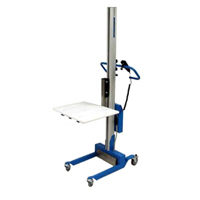 to 20,000lbs., this product ensured proper ergonomic material handling in your facility. 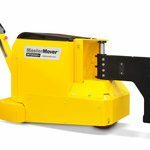 This battery-powered roll pusher and the mover is perfect for increasing productivity and ensuring worker safety whenever heavy loads need to be moved. 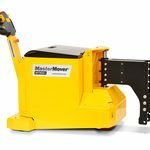 The MasterTug MT1000+ is designed to allow a single pedestrian operator to easily push, pull and steer wheeled loads weighing up to a maximum of 22,000 lbs. 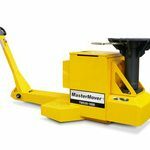 The MasterTug MT1200+ is designed to allow a single pedestrian operator to easily push, pull and steer wheeled loads weighing up to a maximum of 26,000 lbs. 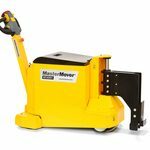 The most powerful pedestrian electric tug offered by MasterMover is the PS3000+ which is capable of moving loads on castors up to 66,000 lbs. A single operator can drive this tugger using a wireless transmitter to push, pull and manoeuvre loads aided by power steering, the only tug to boast this feature. 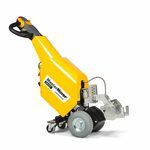 The MasterPusher MP400 is an electric tugger, designed to push loads on rails. Using leverage to gain traction, the single operator simply pushes the machine towards the load in order to start it moving. 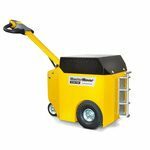 The All Terrain Pusher ATP400 is designed to push wheeled loads, even if the floor surface is less than perfect. Whether it be a long train of roll cages or a huge load on rails, the ATP400 possesses more than enough power.